There’s no question that this sandwich-oriented wing of Tom Collichio’s Craft empire has a clever name. There’s no doubt the colors are nice. And there’s no doubt this is a lovely typeface (pretty sure it’s a version of Century but I can’t quite pinpoint which one). But I can’t help but find fault with the missing i dot, the oddly extended serif on the h (particular to this lockup it seems), and the too-clever-for-its-own-good, flipped-over t in place of the f.
Thanks to my pal Katie Kosma for suggesting today’s waffler. it's the T/F monstrosity. That thing needs to be taken out back and shot. It's like his designer came up with a perfectly lovely logo and then realized he had 50 minutes left in the hour he was charging for and decided to keep going. One can never be too picky when it comes to typography. Keep up the good fight. My first reaction was that it seemed a bit dated, forced and not really compelling. Its not sh*tty, just contrived. Maybe a couple of undoes in illustrator and it has a good chance of looking better. It's the apostrophe that I find off-putting. Can't quite explain why – just feels a little detached. Oh, and the upside-down 't' substituted for an 'f' in just downright pretentious! 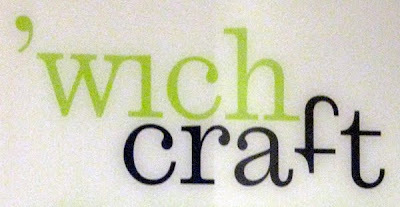 The overall identity for wichcraft is pretty strong. a minor tweak in this logo would make it all great. i really don't know why everyone is bent out of shape about the f/t flip. i like it. what bothers me is the lack of the dot over the i and the serif-smash between the w and the i. the extended serif on the h is... odd... to say the least. even with those imperfections, i'm still intrigued enough to try something from this shoppe. I've eaten there, and this is the first time I've noticed the f/t thing. What I did notice is that the place was over-hyped, and I was disappointed by the actual food. Too many gimmicks - very annoying. Good eye! I would have looked at this for about half a second and moved right along down the road. I also HATE that color green. And the f/t thing is SO annoying. I don't mind the flipped 't' used as the 'f'(i think it is clever), but the missing tiddle on the 'i' and the extended serif are killing me. Plus, the kerning on 'wich seems weird to me. Nicole, that's exactly why I don't like the f/t thing. It's too clever, for no good reason. I don't why you'd want to draw attention to the ft, when the ’wich is the important part. The missing i dot and the extended h serif don't bother me at all, possibly because I can't stop looking at the ft.
At first glance I thought this looks nice, but upon further investigation it's a bit of a mess.